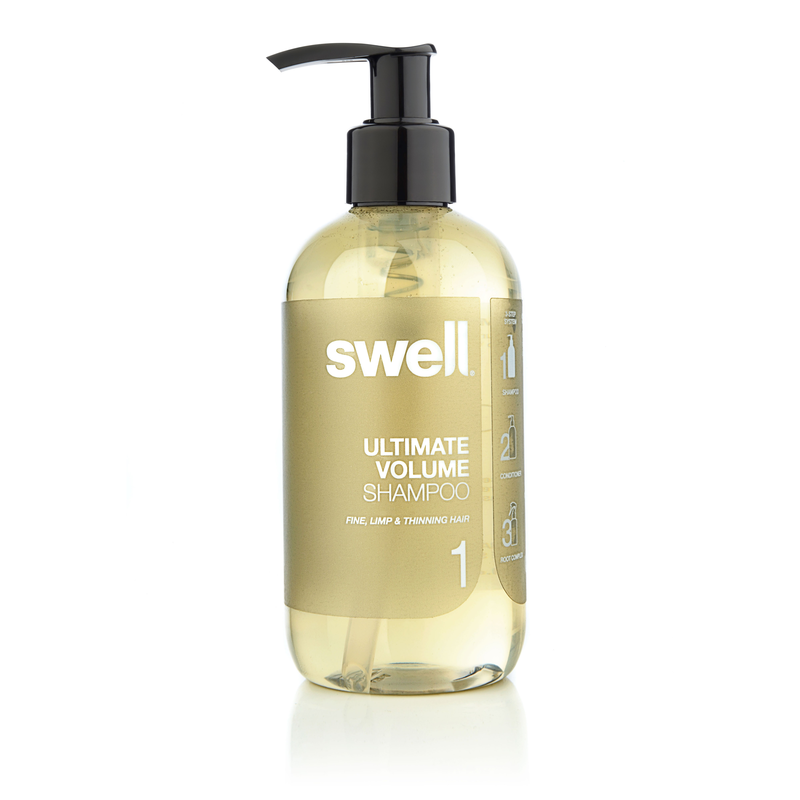 STEP 1 in the Swell 3 Step System - Ultimate Volume Shampoo 250ml. 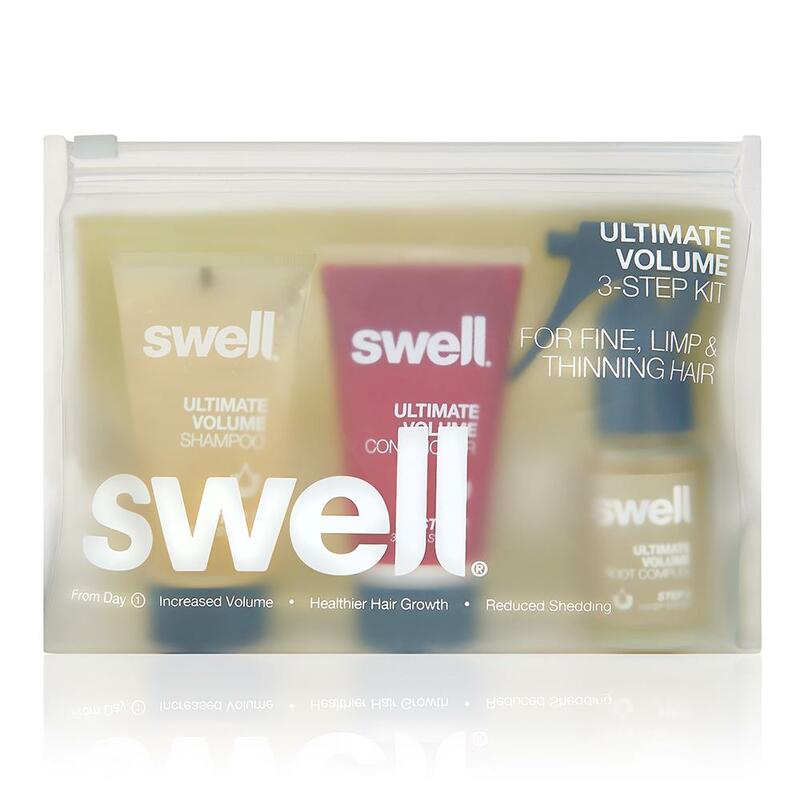 Builds luxurious volume for fine, limp and thinning hair when used as part of Swell's 3-Step System. This colour-safe shampoo has a rich lather and texture. Swell's Ultimate Volume Shampoo leaves hair squeaky clean and starts the volumizing, growth boosting and conditioning process. An elegant champagne colour and a delicious signature aroma from pure essential oils characterizes this powerful volumizing shampoo treatment. 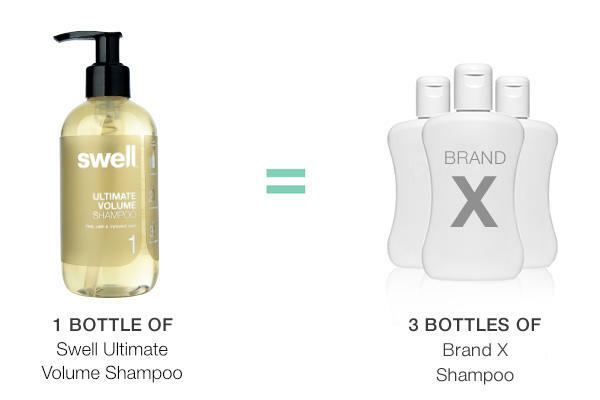 Note: Swell Ultimate Volume Shampoo is highly concentrated and can work out more economical than your regular shampoo. A REVELATION Posted by Liz Rigarlsford on 17th May 2016 Have tried so many shampoos and conditioners, but because I have white hair just couldn't get it right, it was always dry looking! I have just bought Swell and used it twice!! Well - never seen or used anything like it, my hair although not short, is silky and so so shiny!! It's not fluffy or dry and I didn't need loads of styling product - in fact I didn't have to use any!! Unheard of for pale hair. It is indeed a revelation! Thank you Swell, it really is a swell product (sorry for the pun). One & Only Posted by Kizzi on 8th Jan 2016 This is the best shampoo I've ever tried for my thinning hair. Beautifully fragrant, shiny hair & no silocones to weigh my hair down. This is the only shampoo for me. hair fall much reduced Posted by Cathy on 29th Nov 2015 Recommended. I have very fine and thinning hair. Hair fall is really reduced. Even in a couple of weeks. Also fuller and feels well conditioned. Great smell too. Happy camper. Amazing volume effortlessly. Posted by Wendy M on 6th Nov 2015 I've been using Swell for a couple of weeks and amazed at the difference. I had a job interview so had a salon blow dry and requested lots of volume - except I was disappointed as compared to my efforts using Swell it was no where near as full. I'm dreadful at blow drying too but my hair now behaves itself!! Converted. 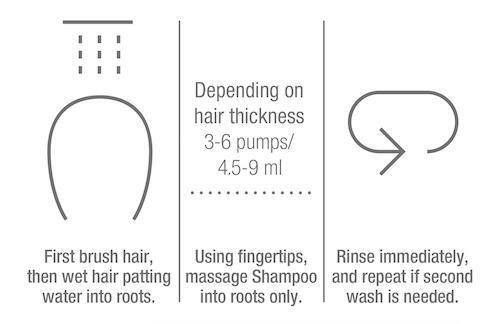 Shampoo best ever Posted by Maggie phillips on 18th Aug 2015 Love it, tend to use a little more than suggested, but does what it says, really pleased there's no nasties this either. Thank you! Posted by Katie on 8th Sep 2014 I have tried various 'volumising' products for my very fine hair and always found them very heavy. I was so pleased to find Swell and find that it worked and made my hair look so healthy. My hairdresser noticed and is so impressed they are now stocking it. I got my mum to give it a go, she was most pleased when someone stopped her at work and asked what she had done to her hair. Thank you Swell team! Does what it says Posted by Satisfied Swell Customer on 1st Sep 2014 I have tried lots of products to make my fine hair (but lots of it) stop being so floppy and none of them worked. 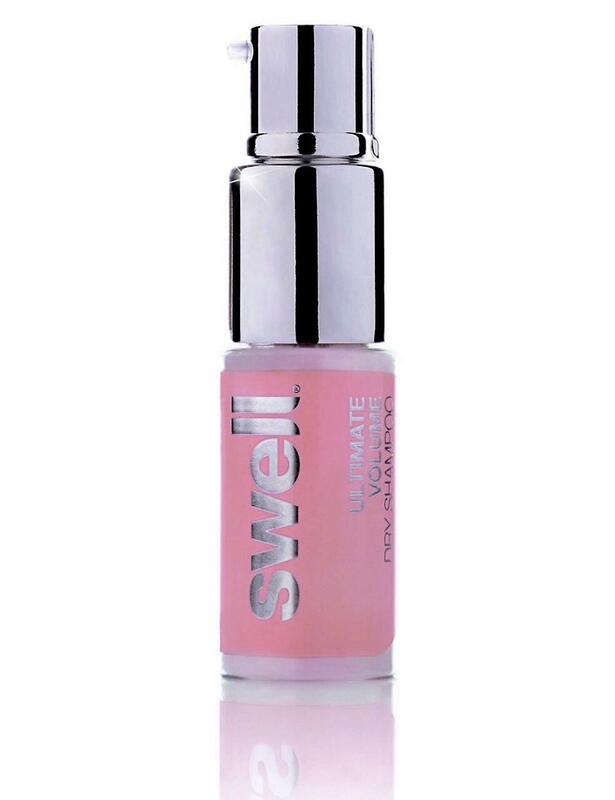 Then a few months ago, I read about Swell, gave it a go and have been using it since. It makes my hair sit much better and gives it more volume. Thicker Hair Posted by Satisfied Swell customer! on 26th Aug 2014 My hair feels much thicker after 3 weeks of use,would recommend this product. Ultimate Volume Dry Shampoo The No.1 professional tool for hair on the move!